Prevent medicine-related accidents by storing medicines safely. Each year, around 60,000 children—or roughly 4 busloads of kids every day—are brought to an emergency room for medicine poisoning because they’ve gotten into medications, vitamins, supplements, or other health products. These accidents can happen quickly, with kids finding medicines in ways and places you might not expect. The good news is that by following some easy, safe storage tips you can help protect your young children and keep medications out of their reach. In 86% of emergency room visits for medicine poisoning, the child got into medicine belonging to an adult. Put all medicines, including your own, up and away, out of reach and sight. Place purses and bags in high locations, and avoid leaving medicines on a nightstand or dresser. Consider products you might not think about as medicines. Health products such as vitamins, diaper-rash creams, eye drops, and even hand sanitizers can be harmful if kids get into them. In 60%* of emergency room visits for medicine poisoning, the medicine was within reach of a child. Close your medicine caps tightly after each use. Choose child-resistant caps for medicine bottles when you can. And remember, child-resistant does not mean childproof. So make sure you close the container tightly after each use and put the medicine away. Put medicine away after every use. Even if you’ll need another dose in a few hours, resist the urge to keep the medicine handy. Put it up and away after each dose. In 49%† of cases, the medicine a child got into belonged to a relative such as an aunt, uncle, or grandparent. Be alert to visitors’ medicine. Well-meaning visitors may not be thinking about the medicines they have brought with them. When you have guests in your home, offer to put purses, bags and coats out of reach of children to protect their property from a curious child. Be alert to medicine in places your child visits. 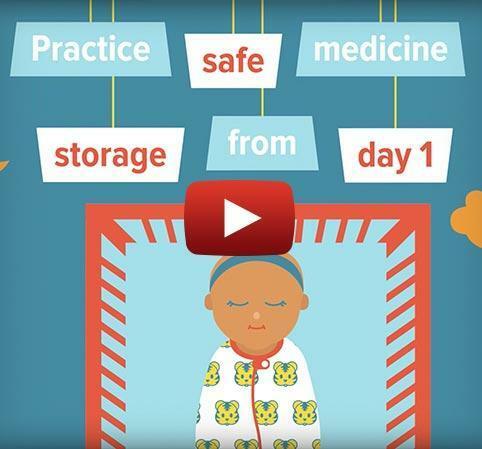 You know to store medicines safely in your home, but also think about medicine safety when your child isn’t at home. Ask people your child visits to put their medicines in a safe place, or take a look around to make sure you don’t see any medicines within reach. 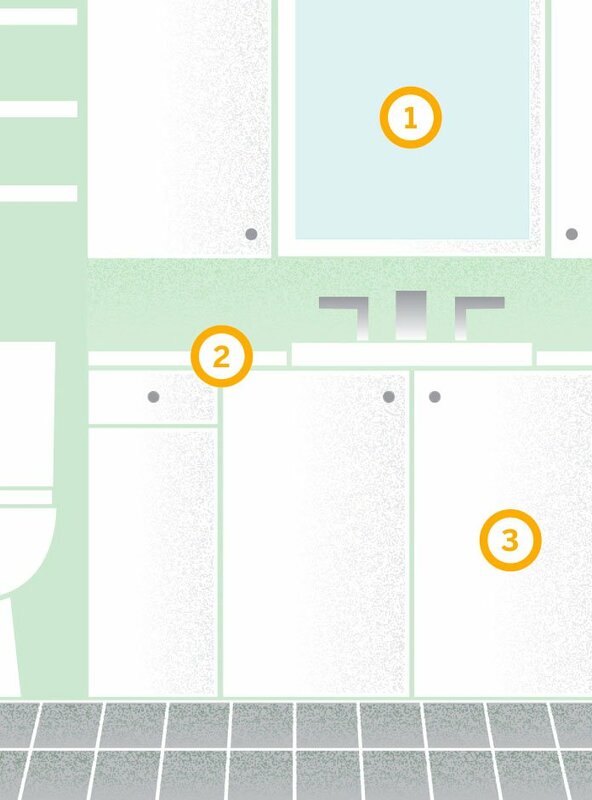 Here’s a visual guide to storing medicine up and away throughout your home—in your kitchen, bathrooms, and bedrooms. Storing medicine out of sight and on high shelves in cabinets helps to keep medicine out of sight and out of reach of children. Unpack all medications, vitamins, and supplements from grocery bags first, before kids can get into them. Children like to climb and to help themselves to things lying around. Remember to avoid leaving medicines and vitamins on the counter even if you think they’re out of your child’s sight. Curious children can easily get into cabinets under the sink. Instead of storing your medicines here, be sure to store them up, away, and out of sight of children. If you use this for medicines or other healthcare items—such as vitamins, eye drops, or first-aid creams—put a childproof lock or latch on the cabinet door. Make sure no medications or supplements have been left out. Store them up and away from children after every use. 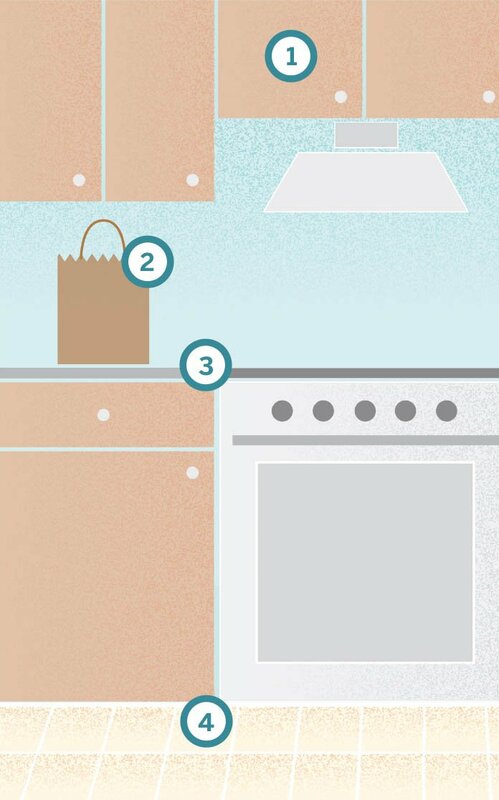 Small children may find it easy to get into cabinets under the sink. 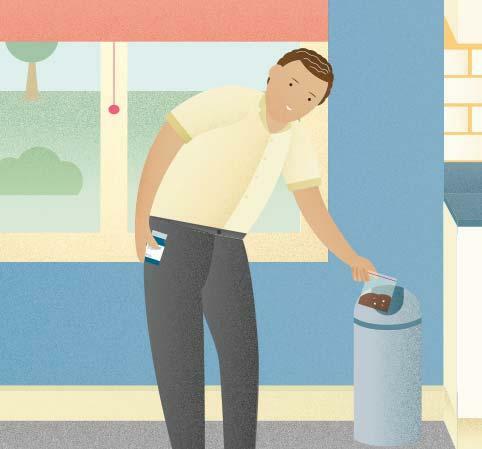 Be sure to remove medicines or other healthcare items and place them up, away, and out of children’s sight. Be sure to store purses, diaper bags, or guest bags that could contain medicine out of the reach of children. Although these are common places to store medicines, they’re unsafe because children can reach them. Check to see if a family member or overnight guest might have left medicines, vitamins, or supplements here. 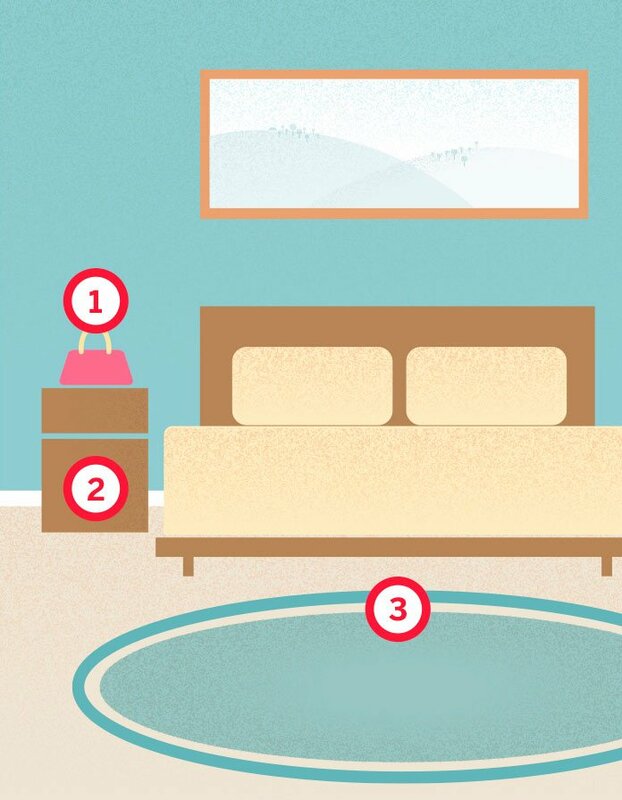 Check to see if any pills have accidentally fallen on the floor or under the bed. Children will be the first to find them if crawling or playing. *Of cases where location information was available. †Of cases where details were reported. ††© Safe Kids Worldwide 2012-2015. Used with permission. All rights reserved. Provided by Safe Kids Worldwide.